MADD. This is a brand new award based on the concept of Movie for Art,Design and Data (MADD. MADD. 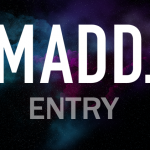 Please visit the newly created MADD. website to find more information about this award and MADD.